The advent of cryptocurrencies has led to a dramatic influx in the number of hardware wallets on the market. However, the numerous alternatives to choose from means it can be hard to know which hardware wallets to use. Moreover, there are those who oppose the idea of using hardware wallets altogether. Actively avoiding the usage of hardware wallets can, however, be foolhardy. Perhaps the most persuasive argument for storing cryptocurrency using hardware wallets is the significant amount of hacks taking place. Several notable cryptocurrency exchanges have been subject to hacks just this year. The cryptocurrency exchange Bithumb was hacked in June and lost around $30 million worth of tokens. Similarly, the South Korean cryptocurrency exchange Coinrail was hacked during the same month, and hackers made away with approximately $37 million worth of digital currency. However, these hacks are dwarfed by those seen during the very beginning of 2018. 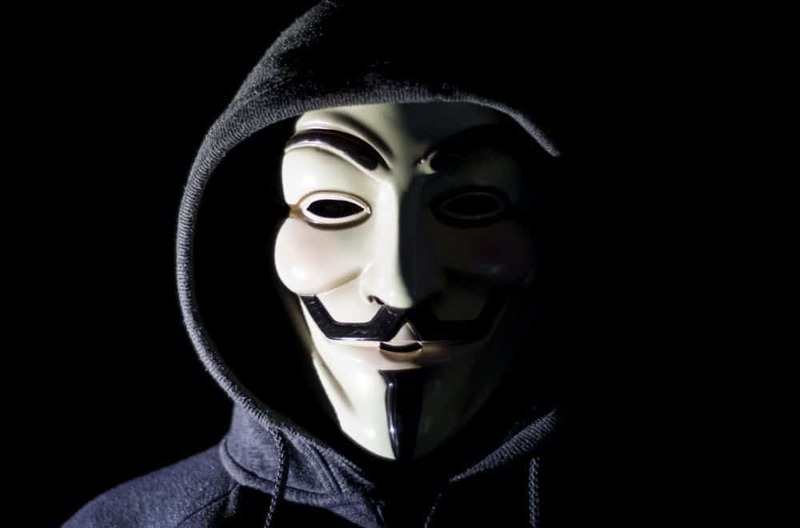 The Italian cryptocurrency exchange BitGrail was hacked in February and has since claimed to have lost between $150 and $195 million in the hack. Nevertheless, this came off the heels of a hack of the Japanese exchange Coincheck. The Coincheck hack reportedly saw thieves steal a staggering $534 million’s worth of cryptocurrency. Although far from all cryptocurrency exchanges have suffered hacks, the ones that have bear testimony to the security advantages of hardware wallets. Furthermore, one of the fundamental ideas regarding Bitcoin and decentralized currencies, in general, is that people – owners – should be able to control their funds. This relates to how those who leave their cryptocurrencies in the hands of cryptocurrency exchanges are, therefore, arguably surrendering nearly as much control as they would with fiat currencies to a traditional bank. Even those using dedicated wallets may use software or desktop wallets that are vulnerable to hacks. Also, the virtual nature of cryptocurrencies means that those used to physical currencies may feel detached from their funds. Hardware wallets present a convenient solution to both of these potential issues. 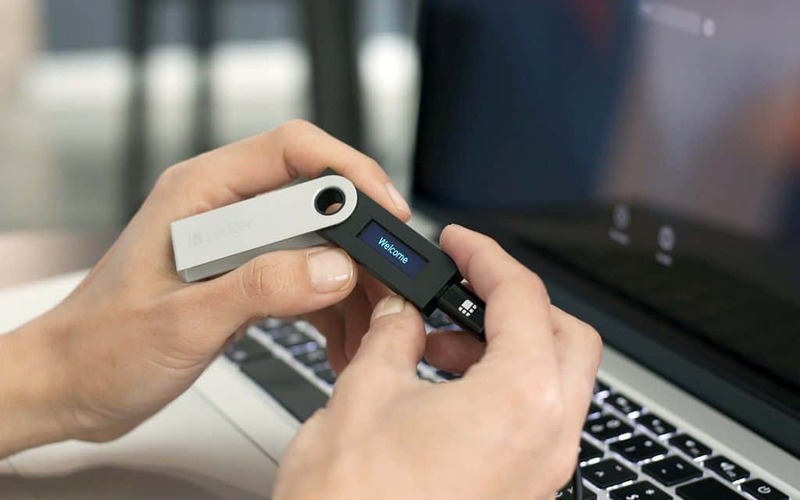 Cryptocurrency hardware wallets are portable devices that can be plugged into other electronic devices, such as computers or phones. For illustrative purposes, think of hardware wallets as USB thumb drives that allow you to securely access your cryptocurrencies. Now, ”how is this accomplished” you might ask. Granted, protected access to one’s cryptocurrencies might sound too good to be true for some. However, the technology is solid and just as good as it seems. More specifically, a hardware wallet is used to generate a user’s private keys in a secure, offline environment. Put simply; this means that users’ private keys will be unreachable for hackers. Moreover, users will have physical control over their keys through the hardware wallet. This does not only grant users peace of mind, but it is also exceedingly handy. Although a hardware wallet is an investment, it is a minuscule one compared to being able to live with the knowledge that one’s cryptocurrency funds are secure. Although hardware wallets are most commonly used to store Bitcoin, it is naturally possible to store other cryptocurrencies as well. The only real problem with cryptocurrency hardware wallets is that they are becoming increasingly popular. This means that those looking for a hardware wallet have a sea of different hardware wallet options to choose from. With all due respect to freedom of choice, this severely muddies the waters for those looking for a hardware wallet. This is why we have compiled the three top hardware wallets to use – so that you don’t have to experiment. Namely, our top three hardware wallets on the market are the Ledger Nano S, the Trezor Model T, and KeepKey. 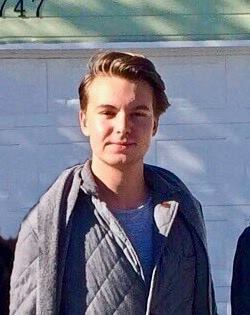 They all have unique characteristics and traits that might make one of them more suitable for your purposes. 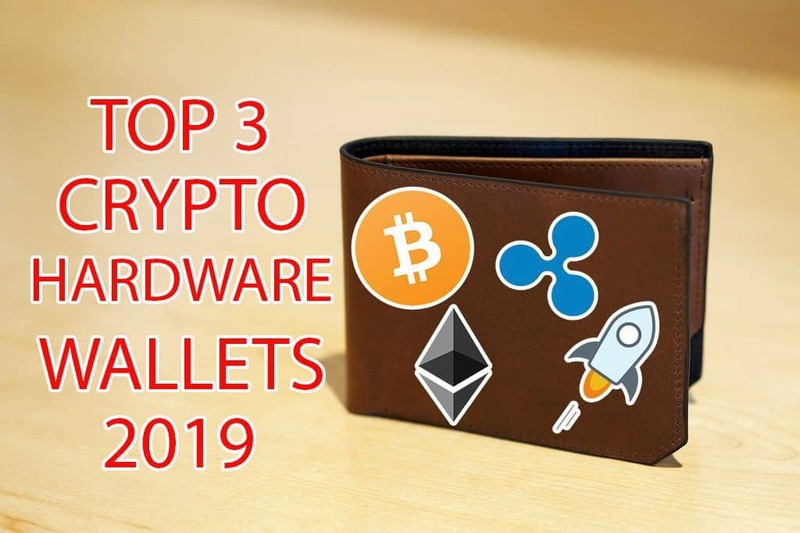 Read on to learn more about the best cryptocurrency hardware wallets 2019! Ledger is a tried and tested security and infrastructure solutions company. The firm was launched in 2014, and it currently employs over 130 employees in Paris, Vierzon, and San Francisco. Moreover, Ledger’s arguably most attractive hardware wallet offering is the Ledger Nano S. This multi-currency hardware wallet is marketed as the ”most popular” one in the entire world, and for a good reason. At the time of writing, more than a whopping 1,356,000 Ledger Nano S devices have been sold worldwide. One of the firm’s hallmarks is that Ledger continuously work to improve the Nano S, with more features, cryptocurrency support, and so on. The Ledger Nano S combines a relatively simple design with powerful features. It has an OLED screen, for users to verify actions on, and only two buttons. Ledger also offer the hardware wallet in a myriad of pastel colors, in addition to a standard matte black. Those looking to spice things up can purchase the hardware wallet in either Saffron Yellow, Flamingo Pink, Jade Green, Lagoon Blue, or even with a somewhat transparent casing. It should be added that the device is also exceptionally portable. Weighing in at just 16.2 grams, the hardware wallet can easily be slipped into a trouser pocket. Furthermore, the Ledger Nano S is built around a chip that offers ”state-of-the-art security.” This ensures that your keys will never be exposed. Rather, your keys will be kept safe in this chip, which is in turn locked using a PIN code. Also, the Ledger Nano S is a truly ”multi-currency” hardware wallet, as it offers support for over 40 different cryptocurrencies. 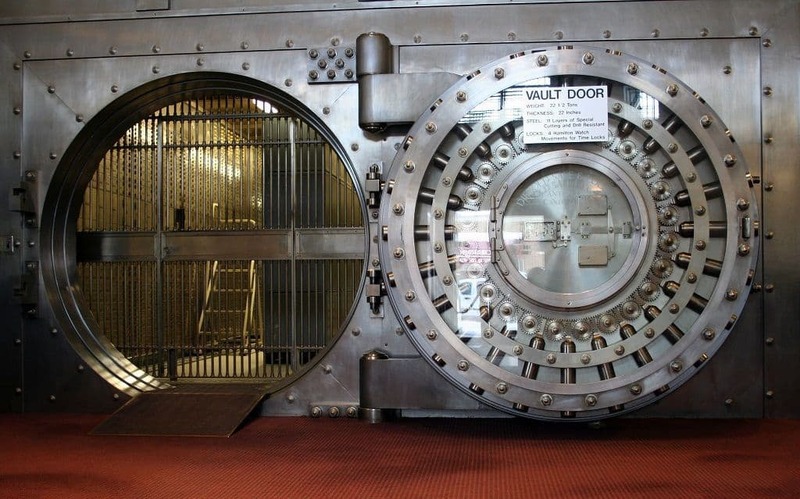 This allows you to manage multiple assets without multiple hardware wallets. Due to this, the USB hardware wallet naturally supports the most common cryptocurrencies – such as Bitcoin, Ripple, and Ethereum. Those who are worried that they might lose their Ledger Nano S can also breathe a sigh of relief. The Ledger Nano S features support for backing up your device with a confidential recover phrase. Put simply, this entails that your account may be restored on another Ledger device – even if you’ve lost your hardware wallet. Although it is a hardware wallet, the software side of things is naturally equally important. Ledger’s Nano S runs the proprietary operating system BOLOS, which shields different applications running from accessing your private information. You will also be able to check your cryptocurrency balance, as well as easily send or receive crypto, using the Ledger Live companion application. The Ledger Nano S packs all of these features in a stylish package that retails for around $100. The device is also battery-free, meaning that it is set up through being plugged into a computer. – Practical and portable design. – The plastic can feel a bit cheap. GET YOUR LEDGER NANOS NOW! Trezor is generally seen as a pioneer in the field of cryptocurrency hardware wallets. The company is also founded by the Prague-based SatoshiLabs, which has been around since late 2013.
has long been the hardware wallet of choice for many, the Model T builds on this experience. Whereas the Trezor One had physical buttons, the Trezor Model T eschews these for an LCD touchscreen design. The device is also outfitted with a USB-C connector for connecting to either computers or mobile phones. Furthermore, the device is greenlit for operating in temperatures ranging from -20°C to +60°C. According to Trezor, the Model T is a ”next-generation cryptocurrency hardware wallet” which allows users to store digital assets. This includes cryptocurrencies, passwords, or any other digital keys. Moreover, your digital keys are owned solely by you. The Trezor Model T is designed to be an entirely isolated device, meaning that your keys will never leave it. If you are to lose your Trezor Model T, you can also recover your entire wallet after the fact. This is accomplished through the use of a 12-word standard recover seed. The 12 recovery seed words should preferably be written down with a pen, and should not be stored digitally. This ensures that you will be able to recover your assets if you lose your Trezor device. In addition to all of this, the Model T can also act as a U2F (Universal 2nd Factor) authenticator token. The touchscreen on the device allows you to see and inspect the authentication request before approving it. The device is also outfitted with an interface for microSD cards, allowing developers to manually install the device’s bootloader. When it comes to cryptocurrencies, the Trezor Model T has support for a veritable plethora of these. The Trezor Model T support more than 500 coins. Some of these include Bitcoin, Litecoin, Ethereum, Dash, Bitcoin Cash and Bitcoin Gold. The Trezor Wallet is also an excellent complement to the device, which will allow you to get more out of your ownership of it. This application allows you to send and receive cryptocurrencies. You can also customize your Trezor Model T with it. The device is fairly compact and lightweight, as it only weighs 16 grams. Moreover, Trezor sell the hardware wallet for €149 before VAT. Although Trezor’s and Ledger’s devices are excellent in their own right, there is a third hardware wallet worthy of mention. More specifically, this alternative is KeepKey. The company was founded in 2015, and its products combine style and security. Nevertheless, KeepKey was acquired in 2017, and is now owned by the cryptocurrency exchange ShapeShift. Unlike its competition from Trezor and Ledger, however, KeepKey is a rather bulky hardware wallet. 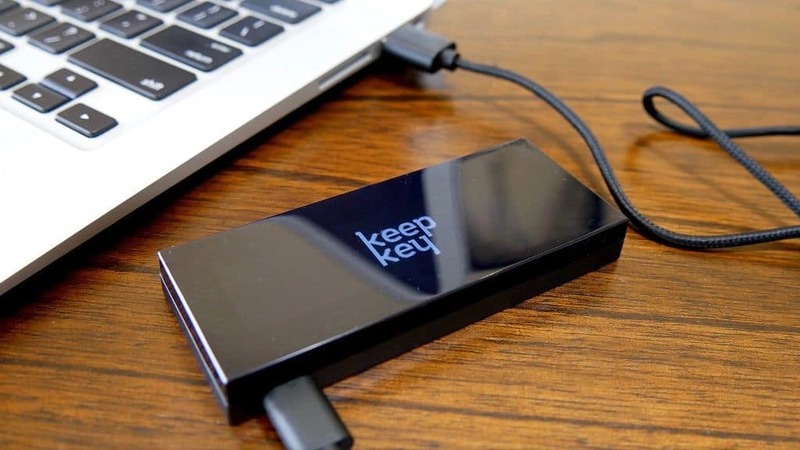 The device weighs 54 grams, and has considerably larger dimensions than both the Trezor Model T and Ledger Nano S.
Like the other cryptocurrency hardware offerings covered in this guide, KeepKey is also equipped with a screen – an OLED screen. 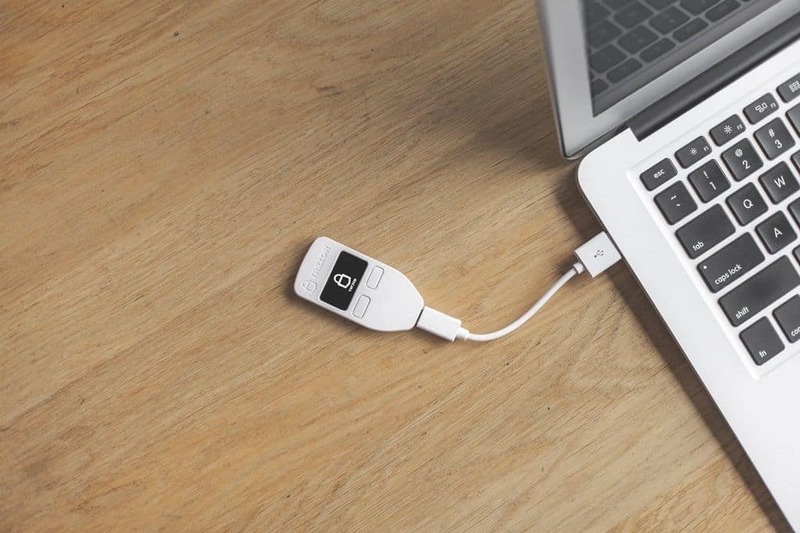 KeepKey is also compatible with Windows, Mac and Linux – just like both Trezor’s and Ledger’s offerings. There is also no operating system installed on the device that can potentially be compromised. KeepKey gives users the opportunity to write down a twelve-word recovery sentence. Through doing so, users can ensure that they will be able to access their funds even if their KeepKey is stolen or lost. Moreover, KeepKey’s user-experience is designed to be secure, as well as allow for considerable ease-of-use. Nevertheless, the device is more suitable for those who are not entirely new to the world of cryptocurrency. This is primarily due to the fact that KeepKey is a so-called ”Hierarchical Deterministic” (HD) wallet. Put simply, an HD hardware wallet can be thought of as a miniature computer. In addition to this, KeepKey features support for Bitcoin, Bitcoin Cash, Ethereum, Litecoin, Dogecoin, Dash, Bitcoin Gold, as well as multiple different ERC-20 tokens. KeepKey is also supported by clients such as Mycelium, MultiBit, and Electrum. The price tag for the hardware wallet is around $100, but has previously been considerably higher – up to $239. The device can either be purchased through KeepKey’s official website or through Amazon. All of these hardware wallets naturally come with their own advantages and disadvantages. At the end of the day, your preferences as a user are going to dictate which device suits you. It can be a good thing for you to decide what your main requirements are for a hardware wallet. Are you primarily concerned with the looks of the device, its portability, or its price? If you currently have substantial cryptocurrency holdings, you should also make sure that the device you are interested indeed supports your holdings. It is preferable for you to have an offline storage space for your cryptocurrencies, in order to protect yourself from hacks. Moreover, having a dedicated hardware wallet can give you a greater sense of control over your assets. Nevertheless, it should be highlighted that there are also many other hardware wallet alternatives out there. However, these three give users great features from solid companies, and are our top hardware wallets for 2019. Previous Post Previous Post What are Smart Contracts?